Iron Fences in Toronto: A Good Fit for Your Property? Iron Fences: A Good Fit for Your Property? Wrought iron fencing was the fencing of empires and the fencing of choice during the colonial period in North America. These days however, the fencing landscape is a crowded one and while iron still carries with it all the historical associations of the past the fact is most people need a good reason to spend the extra money the timeless beauty of iron will cost them. 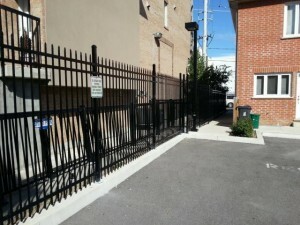 Why Choose Iron Fences in Toronto? Security – Iron is in a class by itself when it comes to toughness. While a determined intruder will have little trouble compromising a wood or vinyl fence, iron will stand its ground meaning you and your family can rest easier. That Look – An iron fence needs no justification. It speaks for itself and for the centuries of tradition that preceded it. Iron fencing imbues a property with a sense of timeless sophistication no other fencing material can match. Versatility – Iron fencing can be used to add a level of security to the top of a stone or brick wall, can be installed between concrete or stone posts, and can be employed just as smartly with a contemporary home design as it can with a restored colonial or brick townhouse. Durability – With just some simple maintenance iron fences in Toronto will last for generations. That simple maintenance mostly entails painting the fence every few years before tiny pits can expand and cause trouble. Pest-Proof – No worrying about termites, ant colonies, bees nests or any of the other many pest possibilities that come with an old wood fence. Iron fencing hangs out the ‘no vacancy’ sign to all manner of unwanted guests. In short, iron fences in Toronto are the old world solution to new world issues of safety, security, durability and value. Iron fencing will add immediate panache to your property, provide a rock-solid deterrent to would-be intruders and still be serving your family generations down the road. Call the fencing professionals at RJ Aluminum Railings today on 416 887 7069 to learn more about the modern day wonder that is traditional iron fencing and discuss how it can be used to enhance the value of your home. Our friendly and helpful sales staff will be happy to answer all your questions.